Our unique retail + design co-op is geared towards the smart shopper seeking special, handmade items to accentuate his or her own wardrobe, or to find that one-of-a-kind piece to add to one's home. The shop is largely inspired by the designers that are part of "The Collective," each adding their own take on craftsmanship, and providing designs for said customers to spot in a fleeting moment of their adventure here at Workspace Collective. Last Wednesday, I was lucky enough to find myself at a brainstorming meeting at the shop, surrounded by six of our designers, one of which was dialed in on speakerphone, along with our in-house marketing guru and photographer, and one of our high-fashion aficionados of an intern. 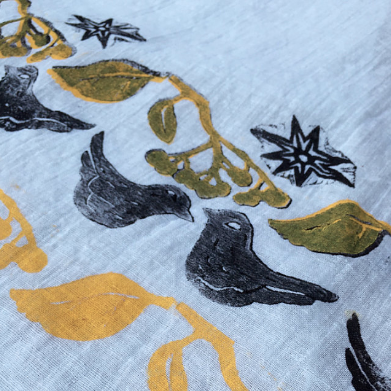 When I asked the group to talk about their experience having been part of Workspace Collective this past year, the first thing that came up was how one of our designers, Karin Mansberg of BlockPRINTED Art, loved working at the bench with another designer working right along side her. At the time it was Brian McCarly, of Simply Antonio (anything but ordinary art- she was block printing her designs onto fabrics, and he was hand designing leather belts, ceramics and a bit of acrylic paintings. We're going to celebrate these two designers this month, and they will once again, be working side by side on Thursday, October 19 from 4PM - 6PM. The aspect of handmade is important to Karin, and the slow and purposeful process of making is meditative. 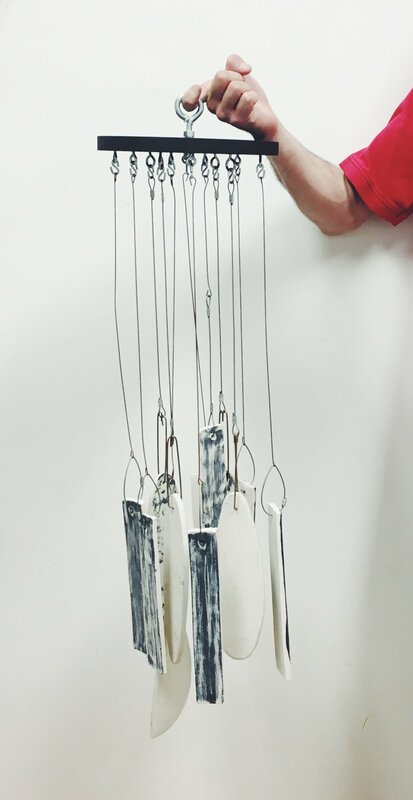 Throughout her process, she does not focus on volume, but rather on crafting a unique piece. The other important factor of slow fashion to Karin, is to work with natural fibers that wear and age well. Karin searches for unused linens and cotton yardage, which depending on the fabric weight, become cloth napkins (which we received as a lovely wedding gift from Karin) or bags. Her credo: to minimize waste whenever possible. 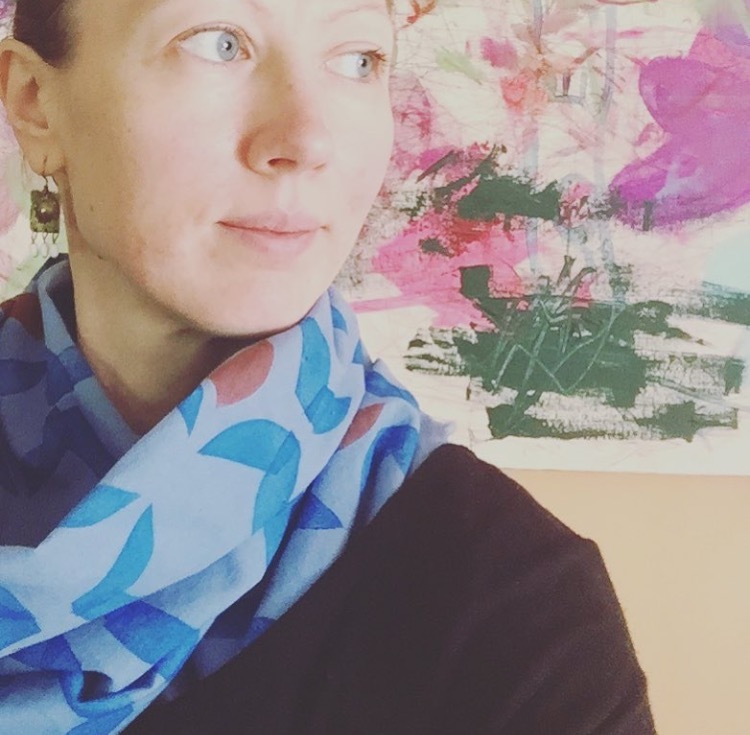 Because she is often dependent on the size of found material at hand, Karin makes limited edition block printed fashion accessories: tote bags, zipper pouches, scarves - with embroidered or crochet details, and all available at Workspace Collective. She especially likes working with repurposed denim. The zippers on pouches and coin purses are often from discarded jeans and other garments. Karin's distinctive style embodies nature with her use of greens, shades of blues and organic shapes representing the silhouettes of billowing leaves, cute little animals and delicate waves. I'm excited to be celebrating this brilliant woman this month, and I hope that everybody really can appreciate her work, which reflects Karin's easygoing, minimalist aesthetic for the modern fashionista. I have my husband to thank here, for his curious knack of developing absurdly unique friendships, and for introducing Brian McCarley (one of those wacky friendships) of Simply Antonio, to Workspace Collective. Thinking back on the first time we met, I was so nervous that I scared Brian off. My passion for meeting these designers is so uninhibited and honest, that I get so caught up in how magical some of their creations are. Brian finds his inspiration from things around him - much of which comes from dealing with international struggles. He served for 8 years with the United States Navy on active duty and had the honor of serving on two deployments; the USS George Washington and again on the USS Harry S. Truman. During his service he visited countless countries around the world and had many great experiences which greatly influenced his artwork. The main reason that Brian is part of the makers movement is all about creative expression. 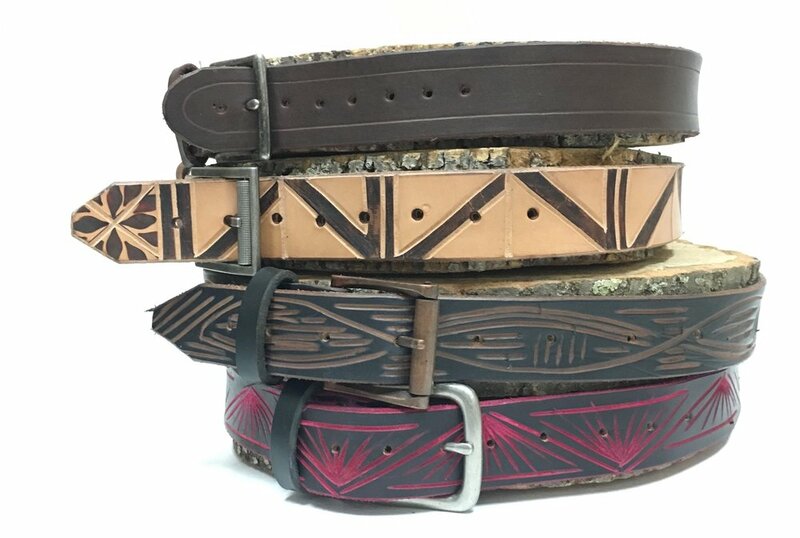 For example, Brian utilizes upcycling as one of his design methods, where he sources used leather, belt buckles and other findings as a medium to create belts. Though a sustainable way of sourcing, Brian's design process is even more refined in that he uses a leather burning tool to carve unique shapes and striking designs into each tailored and thoughtfully created piece. Brian is also a master ceramicist, creating each stunning piece by hand. Leaf bowls, plates, wind chimes and candle holders - all hand carved, painted and glazed to perfection to creatively express his art. Brian is currently employed as a teacher's assistant at Western Connecticut State University under the great Jurg Lanzrein, and has had artwork featured in over 22 art shows in the last 6 years. Upon completion of his masters in school counseling degree, he plans to attend graduate school where he will pursue a Masters of Fine Arts so that he can help spread the healing power of art to children and adults all over the world. The art of collaboration that exists here enlivens me, and it fills my entire being with so much gratitude to see my vision of Workspace Collective happen right before my eyes. Like all of our designers, I am grateful for Karin and Brian as they give to art with their whole hearts, and are an integral part of our growing community. Cheers to these two this month, and don't miss out on their Duel Workbench Event on Thursday, October 19 from 4PM - 6PM.